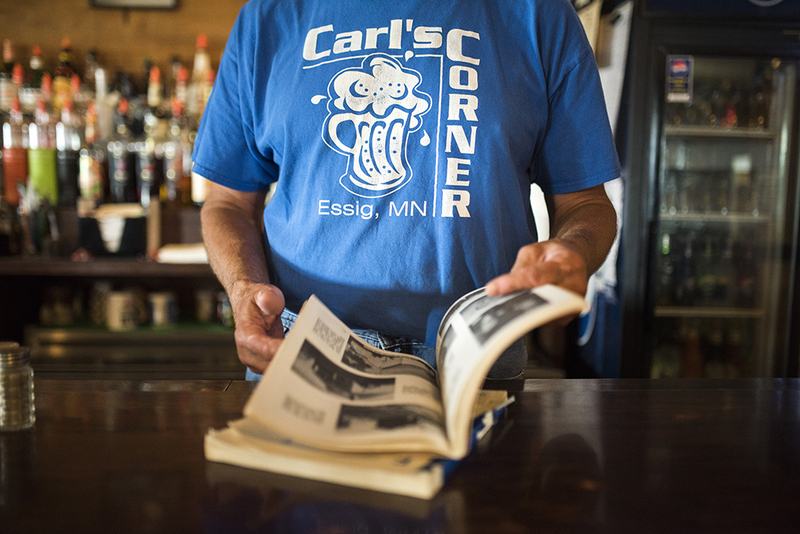 Milk at Carl’s Corner in Essig, Minnesota, is 80 cents a glass, $1.50 if you want a large—which, from a quick survey of the wood-paneled dining room, several patrons do. We’re on day two of our three-day road trip from Lake City to Luverne. Normally, this cross-Minnesota trek would take four, maybe four-and-a-half hours to complete. But our goal isn’t to get from state line to state line as quickly as possible. It’s the opposite: to take as many back roads, stop in as many small towns, and talk to as many people as possible. Our route takes us through more than 30 towns, varying in size from large to small to so minute that there’s little more than a sign telling us we are entering and then, almost instantly, leaving. Some of the towns have clear cut identities and reasons for visiting. St. Peter has Gustavus Adolphus College and is a short drive from Mankato, both of which invigorate its downtown and diversify its population; trendy River Rock Coffee is bustling with 20-somethings the afternoon we visit and, across the street, a little girl wearing a hijab stands in the doorway of the halal meat and grocery store. 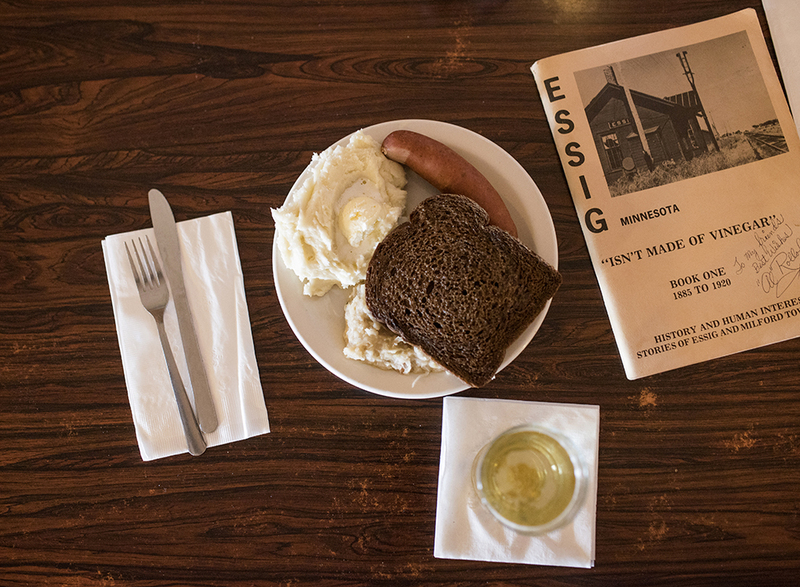 New Ulm boasts its German heritage with Veigel’s Kaiserhoff restaurant, Guten Tag Haus gift shop, and August Schell Brewing Company’s circa-1860 brewery and new Starkeller taproom. 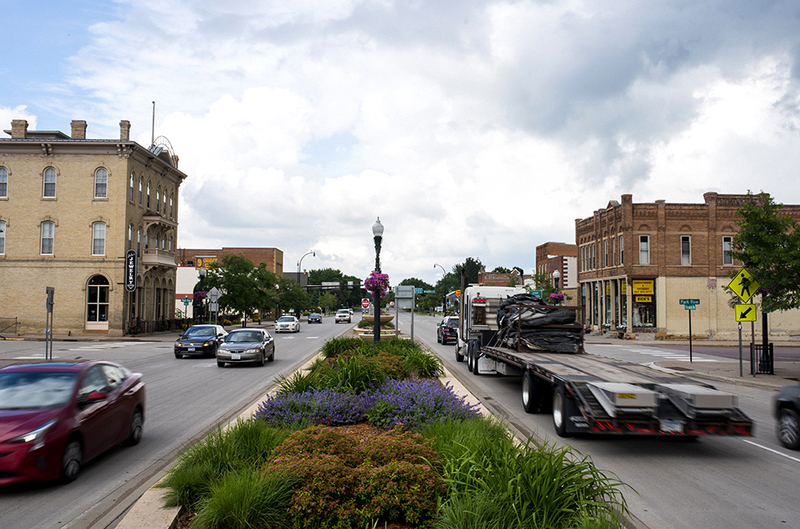 Luverne’s Main Street has been meticulously restored, and places like Palace Theatre, Coffey Contemporary Arts, Brandenburg Gallery, and Take 16 Brewing infuse the city with creative energy. And that’s why we’re here: to dig. We live in Minneapolis and St. Paul, in two of Minnesota’s 13 totally urban counties, of 87 counties total. We want to see another part of our state; to immerse ourselves in the agricultural core of Minnesota and meet its residents; to put faces to statistics and landmarks to towns that otherwise, to us, are just dots on a map. We arrive in Essig around noon on a Wednesday. 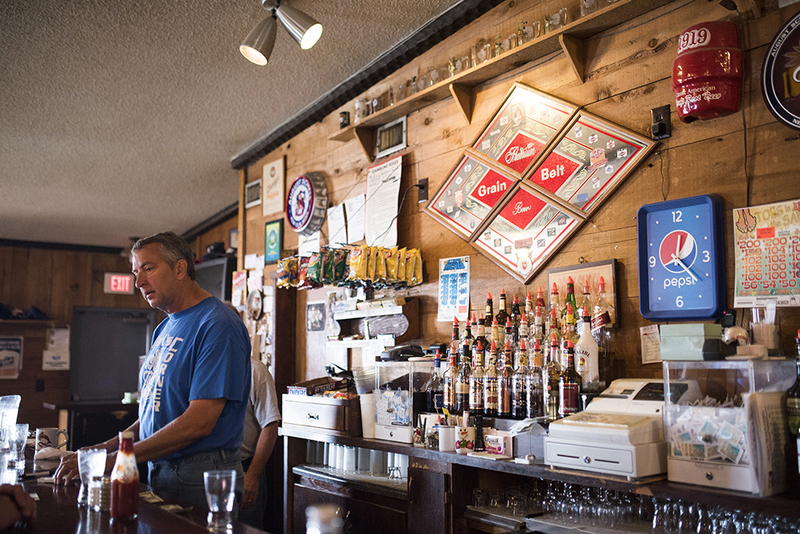 Located just six miles west of New Ulm, the unincorporated town feels like a portal into another era. It’s four blocks small, and best known for a Prohibition-era raid of a moonshine distillery owned by one of Al Capone’s gangsters, and the fried chicken at Carl’s Corner, which was awarded the 2014 WCCO-TV Viewers’ Choice for Minnesota’s Best Fried Chicken—a fact no fewer than five people tell us during our visit. Neon Grain Belt signs light up the restaurant’s windows and, inside, the walls. The owner knows everyone who comes through the door and immediately sets about discovering who we are and why we’re there. Even though Carl’s Corner is his place, his name isn’t Carl—it’s Pat Berg. He and his brother, Ken, bought the place from Carl “ages ago”; it was easier to just keep the name, Pat says. 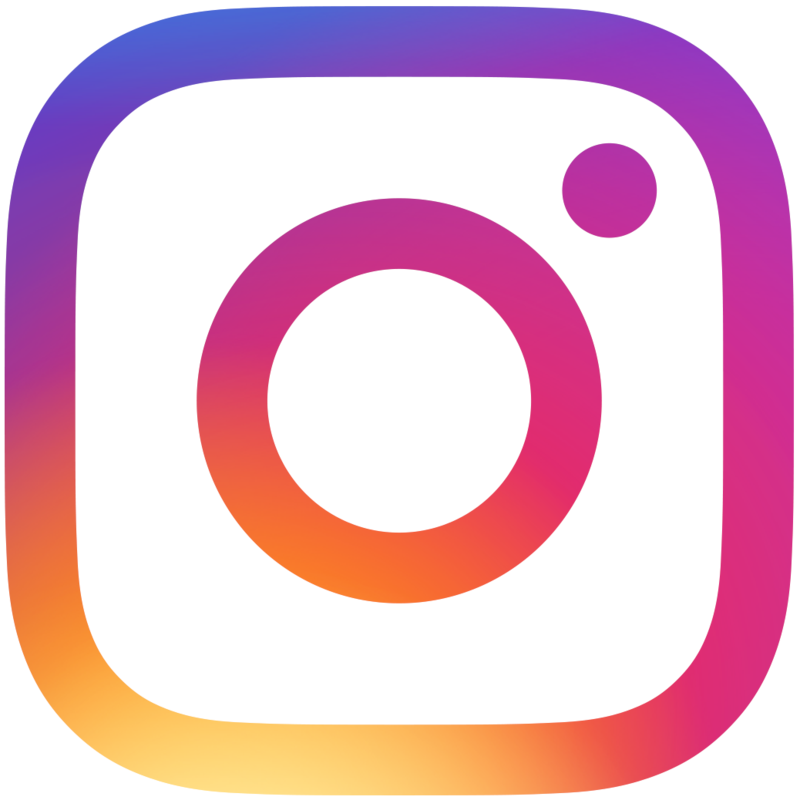 By 12:40pm, most of the tables are full, many with men wearing faded baseball hats and chunky boots, their sun-weathered faces covered with various combinations of mustaches, beards, and sideburns. After observing us from afar and lobbing the occasional commentary at Pat—“If his mouth is open, he’s lying; if it’s closed, he just lied!” “Tell ’em about the ’CCO story!”—a few of them join us at the bar. A lanky man with bright-white veneers describes himself as a “recently retired half-assed farmer.” Another is a former dairy farmer who transitioned to crops six years ago. His son-in-law is also a farmer, and works on a 10,000-acre farm—which isn’t the norm, he says, explaining that the majority of farms in the area average 500 acres. 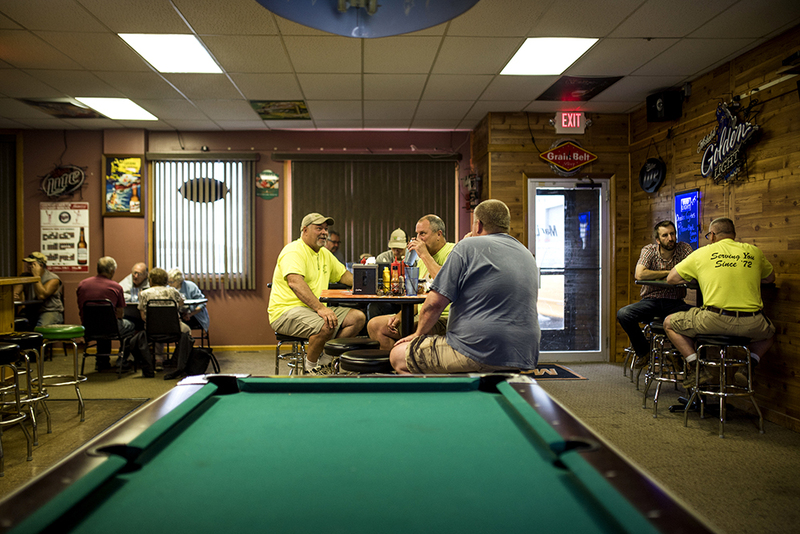 Most of the lunch crowd are regulars, and most are farmers, Pat says. Agriculture employs just 10 percent of the men and women living in rural Minnesota (educational services and the health care and social assistance industry rank at the top, employing 23 percent of rural residents), but on this day at this time at Carl’s Corner, its role seems to be more leading man than supporting role. 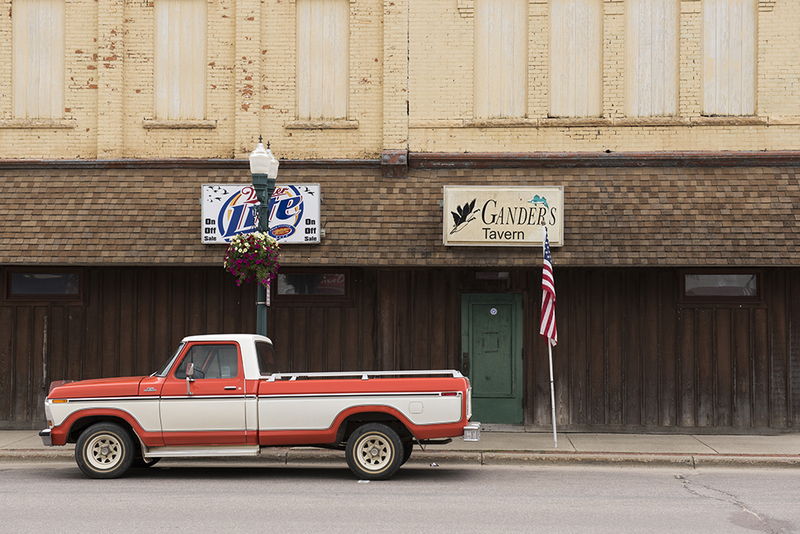 More than a quarter of Minnesotans live in non-urban areas, their towns’ vitalities tied to the soil and the sun and the degree to which those two unpredictable elements decide to get along. Dennison is one such town. 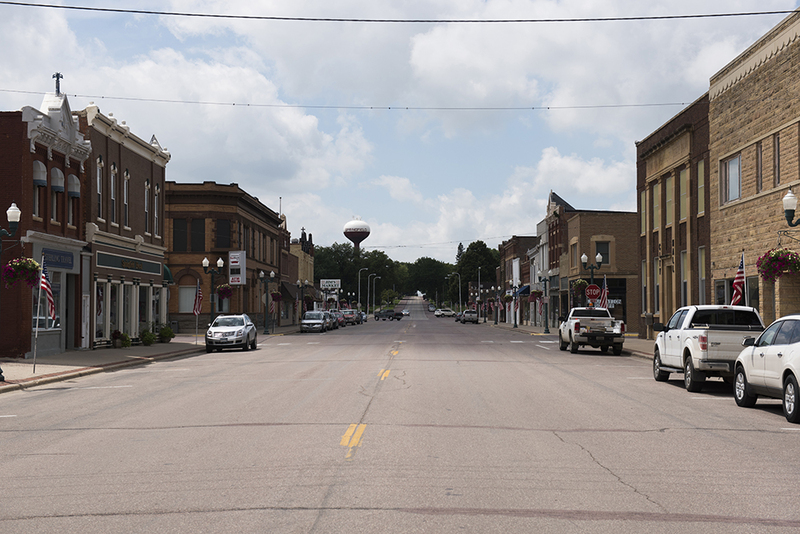 Population 171, the five-block blip is located nine miles from Northfield, halfway between U.S. Highway 52 and Minnesota Highway 3. It’s the kind of place that, unless they need gas, travelers pass through as fast as the reduced speed limit allows. Corn fields creep right up to the town’s main drags, 375th Street and Goodhue Avenue, and are broken up only by a smattering of houses, the city hall, Marathon gas station, Farmer’s State Bank, a lifeless post office, a mechanic shop, Fireside Lounge restaurant, and MarLea’s Bar. At first glance, the place appears to be a ghost town. We’re the only ones walking around at noon on a Tuesday, and, after peering into a handful of boarded up businesses, we’re not totally convinced there are even 171 people who live here. Before packing up and moving on, we decide to pop into MarLea’s for a drink. Inside, we’re surprised to find a dozen men and women eating lunch: a four-top with two men and two women, all elderly, all eating cheeseburgers; and a handful of high-tops that host leather-skinned men in well-worn T-shirts, steel-toe work boots, and belted cargo shorts. We settle in at the bar and start chatting with LeAnn, the bartender/waitress/sole non-kitchen staffer this particular afternoon. She tells us her husband works as a field sprayer and has struggled with flooded fields caused by the previous week’s 10-inch rainfall. Most of the men who come in for lunch are either construction workers or farmers, she continues, adding that business ebbs and flows with the weather: “On rainy days, like today, it’s packed; on sunny days, not so much.” Posters advertising something called the Dennison Demolition plaster the walls. LeAnn tells us it’s a traveling wrestling show the town hired to put on an outdoor match that Saturday—they ordered bleachers and everything. “I just hope a lot of people show up,” she says, then waves at the two men who just walked in. She starts pouring a Pepsi and a Mountain Dew. Just like Pat at Carl’s Corner, LeAnn already knows what they want. We’re only there an hour, but that’s all it takes for Dennison to switch from being just another name on the map to being an actual place—a community with character and an identity. It’s also enough time to realize that, like Essig, Dennison likely wouldn’t exist if not for the farmers, and the workers like LeAnn’s husband whose industries rely on farming, patronizing the local watering holes with enough regularity to ensure that they survive. It’s not impossible, though. “This area is relatively good and thriving in that there’s a lot of young people [farming],” he continues, pointing to surrounding properties, all of which are owned by young couples. 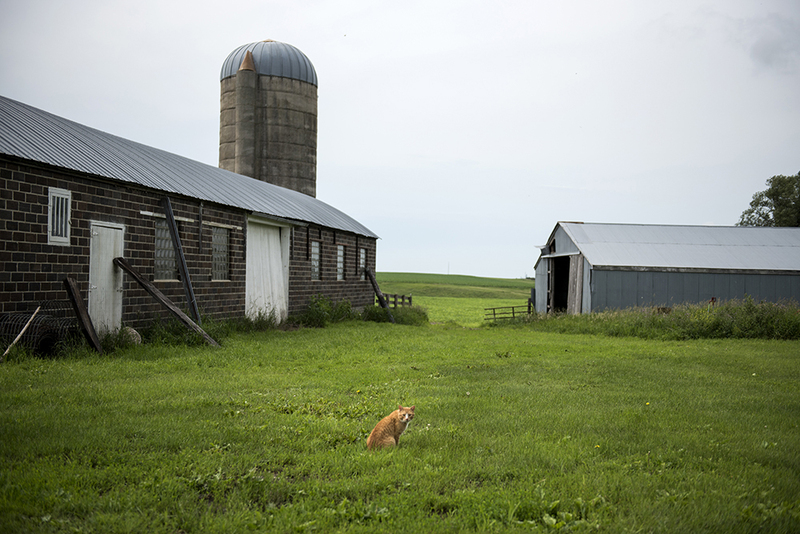 The objective of seeking out the face behind a place, be it a 10,000-acre feed-corn farm or a 55-person capacity bar, echoes in my head as we drive back to the Twin Cities. It’s easy to take the most efficient route from Point A to Point B. But efficiency doesn’t lead to invitations to outdoor wrestling matches or advice from a bartender in one town on what to order at the supper club you’re visiting the next night in the next town. There’s value in slowing down and stepping outside the comfort zone of one’s own car and routine—in talking with someone who, on paper, you have nothing in common with, but knows more than you ever will about cover crops and can tell you where to find the best baked goods in town. And who knows: swapping efficiency for intimacy might also lead to discovering the best fried chicken in Minnesota—as long as you arrive after 5pm. 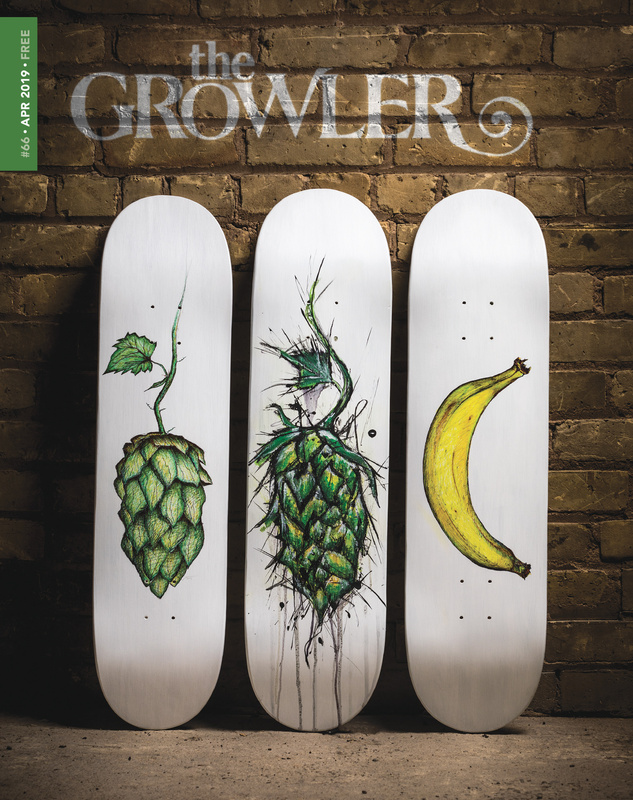 Ellen Burkhardt is the managing editor of The Growler. When she's not writing, editing, or interviewing, chances are she's on the road seeking out good food, drink, and fodder for her next story.